Salvia discolour with its deep navy blue/purple to black flowers and contrasting grey green stems is an outstanding salvia for a relatively frost free area. This is one of the more unusual salvia species and well worth a place in the garden. This salvia is originally from Peru and will flower from summer right through to autumn. It will reach around 1m in height and has a nice arching habit. 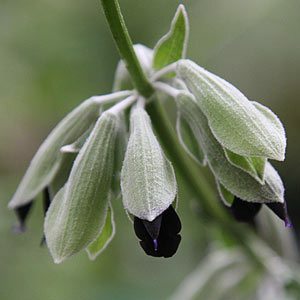 Also known as the ‘Silver Leafed Sage’, the foliage or S. discolor has a silvery grey green upper side with a lighter silvery underneath that really contrast the dramatic sweetly scented flowers. Like most salvias this Salvia discolor requires a well drained sunny position, good drainage in winter is essential. Works well as a cut flower, and the aromatic foliage has a pleasant scent. Flowers are attractive to bees and birds. Salvia discolor can be cut back in winter, or tidied up throughout the year. Best in areas where summers are reasonably dry and not really suited to tropical or sub tropical areas. Propagation is from seed or from cuttings taken in late summer to autumn. Spread – Will spread to form a clump of .5m over time. Flower Color – Deep purple. Flowering period. – Long flowering from spring through to autumn. 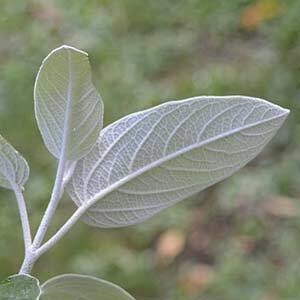 Foliage – Silvery mid green with a contrasting silver reverse. Salvia discolour is available for sale from the following nurseries.